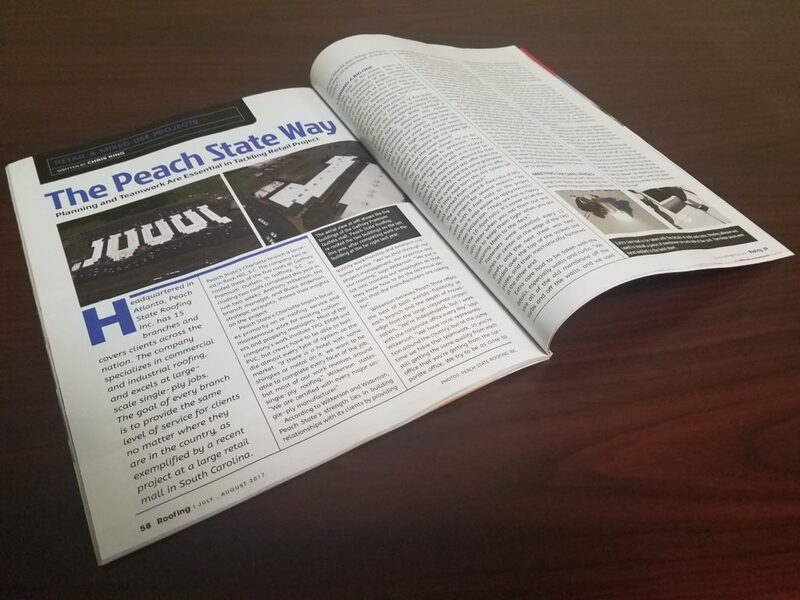 In this past month’s issue of ROOFING MAGAZINE, Peach State Roofing was proudly honored to be included in one of the top publications for the commercial roofing industry. The featured project was a large outdoor mall for Simon Property Group -Gaffney Premium Outlets. Three of the five buildings in the complex were re-roofed by Peach State Roofing as a recover application to meet a set specification and all projects passed the manufacturer’s roof inspection with excellent reviews. The manufacturer of choice on this project was selected by the owner as Firestone Building Products and a high density cover board was the insulation recovery board of choice. TPO in a 60 mil thickness and a 20 year warranty were chosen by the owner and overall the project was executed with great management. The project was managed by senior project managers Anthony Wilkerson and Blake Wideman whom did an excellent job with daily reporting and communication with the real estate contacts. Below is a brief exert from the article…. Peach State’s Charlotte branch focuses primarily on re-roofing, service and maintenance work for existing customers and property managers. Most of the company’s work involves TPO, EPDM and PVC, but crews have to be able to handle almost every type of system on the market. “If there is a hotel with some shingles or metal on it, we want to be……. Peach State Roofing is a national commercial roofing contractor specializing in TPO, EPDM, and PVC roof systems as well as built up roofing and modified roofing repairs services. With 15 offices nationally, a local office is available to serve commercial real estate properties across the country. Check out our website locations page for more details.